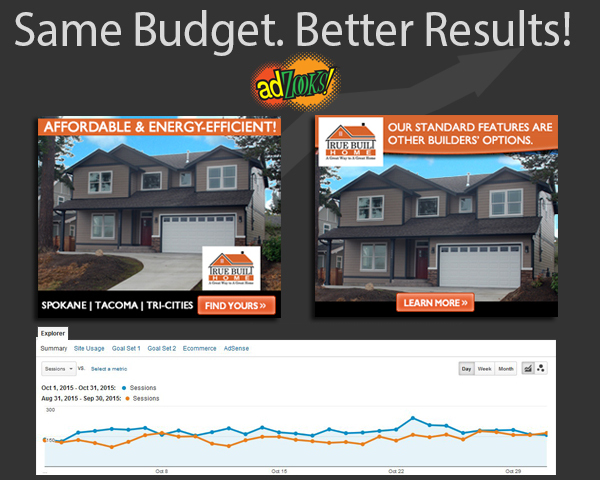 True Built Home – Display, Search & Content Marketing | ASTRALCOM - Content Strategy, Conversion Marketing and Customer Acquisition. True Built Home – Display, Search & Content Marketing | ASTRALCOM – Content Strategy, Conversion Marketing and Customer Acquisition. When we met True Built Home, they weren’t entirely happy with the results they were getting from their current agency. We discussed ways in which we could help them to achieve better returns with the same budget. So we put together a display, search and content marketing plan that started to deliver results right away – at day 6, we already see an 8% increase increase in targeted traffic. Other important metrics have been lifted, too. For example, pages per session and average session duration are both up approximately 11% and overall conversion rates, across channels, are up by 21.8%. By the end of the month, the multichannel effort had delivered a 19% increase in new visitors and an overall 26% increase in sessions. Sometimes clients know that they could be getting better results than what they are currently getting and this post is a great case in point. Most of the time, though, clients don’t know that they could – should – be getting better performance and return on investment from their agencies and partners. Read more about True Built Homes’ campaign success in this post. Then contact us to see how much better your results could be with ASTRALCOM as your partner.